Urban, social and architectural historian, Justin Ferate is the former Director of Adult Education for New York's noted college, Cooper Union. 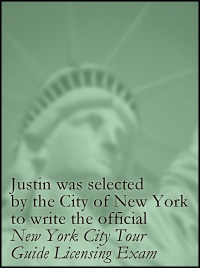 In addition, Justin was formerly the Director of Tour Services for Gray Line New York. Justin Ferate has been on the Board of Directors of the Fine Arts Federation of New York City, the National and Metropolitan chapters of the Victorian Society in America, and the NYC & Company Tour Guide Enhancement Program. Justin Ferate is also active in numerous historic and preservation societies. With a background in Urban and Architectural History, Justin was awarded fellowships to study 19th Century Architecture and Design in Philadelphia, Newport and London. Both nationally and internationally, journals, magazines, radio and television presentations have reviewed tours by Justin Ferate or have used his tours as a major source of information for their presentations. Among other awards, Justin Ferate was honored by the AAA Guide to New York, which rated his tour of Grand Central Terminal as the “Best Walking Tour” in New York. Recently, the Governor of New York State and the NY State Tourism Council recognized Justin Ferate as New York’s “Most Engaging Tour Guide”. In 2003, the New York City Department of Consumer Affairs selected Justin Ferate to create the New York City Professional Tour Guide Licensing Examination. This is a required examination for anyone who conducts tours in New York City.